It was standing room only last night – Wednesday, January 2nd – at the monthly meeting of the Ocean Beach Planning Board. At the peak of the evening, there must have been 30 people – not counting the ten members of the Board itself – , and most had come for the controversy over the Police Trailer in the middle of the OB Pier parking lot. Among those standing about was a ‘who’s-who’ of OB’s merchants and the village establishment. Jane Gawronski, Chair of the Board, gaveled the meeting to order right around 6pm. After a few reports, she brought the meeting to the Action agenda. First on was Sprint Wireless’ application for a renewal and upgrade to their 9 antennas on the outside of the Masonic Lodge, located at 1711 Sunset Cliffs Boulevard. Megan Murphy – representing Sprint – gave a spirited presentation to why they need to upgrade and improve their equipment for 4G – for all the Smartphones people are getting. There will not be an increase in the number, Murphy said, simply switching old attachments for new radio frequency boxes. Their permit for ten years had expired and the company was back for approval for another ten years. The Project Review Committee, headed by vice-chair Landry Watson, had recommended that the full Board approve the application. With no opposition either from the audience or the Board, the motion to approve quickly carried unanimously, 9 to 0. Moving promptly to the big issue of the evening, Gawronski introduced Lt. Natalie Stone of the San Diego Police Department to make a pitch for the police trailer. 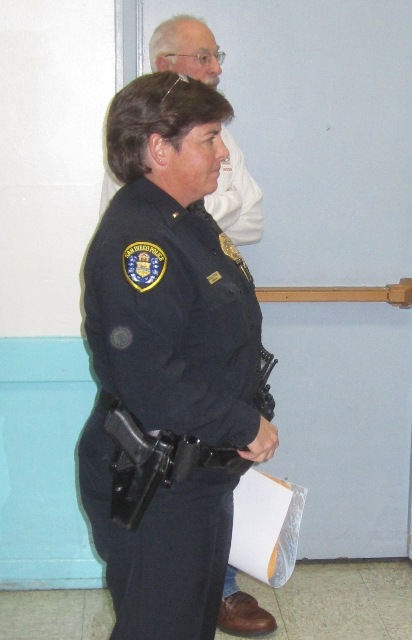 Lt Stone, admitting that she was new to Western Division, explained that Asst Police Chief Boyd Long had personally requested that she handle a Notice of Violation on the trailer from the California Coastal Commission, received by the City in July 2012. A local complaint had stirred the Commission to issue the violation notice due to public view and other violations. This led her to apply for a Coastal Development Permit for a permanent building with the Commission, a cost of $5,000 to $8,000 Lt. Stone added. She then gave a brief history of the trailer itself. 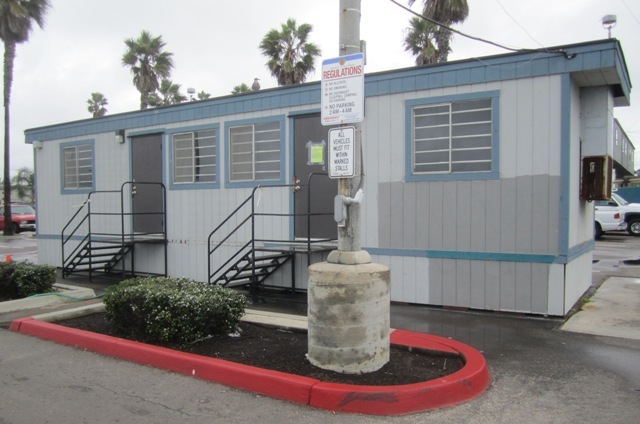 The trailer was installed after the original OB Police storefront on Newport Avenue had closed due to budgetary problems in 1999. After it closed, crime, vagrancies and drunkenness increased, she said, and in response the OB Mainstreet Association explored getting a temporary trailer, “to entice police officers to take breaks, do reports” inside. In fact, Lt Stone iterated, the police trailer issue came before this very Board and was heard back in 1999. Apprently, the Board did approve it back then as it was installed in the location where it currently sits. Once the trailer went in, cops noticed a lot less crime problems in the area, she said. “It can’t be moved to Robb Field,” Lt Stone stated. The Police Department decided that the Pier parking lot was “the best place”, as it had water and electricity; the other possible locations did not have those utilities, including access for the company that flushes the restrooms in the trailer. Chair Gawronski then opened up the floor for audience members to speak. Next to speak was Dave Martin, current President of the OB Town Council. But he was there this evening, he said, as an OB business owner for 11 years; Martin is the owner of OB’s Shades restaurant. “I’m in full support of the trailer,” he said, and he has offered to repair and install a curtain around the trailer. He asked that the trailer be repainted and that the police seal or logo be plainly exhibited on the trailer. Apparently, for a period of time, the restrooms inside the trailer had not been flushed and were inoperative. This situation forced police officers to travel to Western Division over in the Morena District or to another storefront in the Midway area. The Board: from left to right – Tom Gawronski, Barbara Schmidtknecht (hidden) Scott Therkalsen, Kelly Taing, Jane Gawronski, Landry Watson, Giovanni Ingolia, Scott Waschitz , Bill Bushe. Craig Klein then spoke. Klein – a former member of the Planning Board until just recently – owns property along with his spouse Julie and is a business owner – and surfer, he said. “Having a police presence in the parking lot is a definite deterrent to crime along the seawall.” Without the trailer, he said, there will be more vagrancies, more drunkenness, and more drug-dealing. Klein urged the Board to grant the permit. Julie Klein strode to the front of the room. Julie is active in the OBMA, and is known to be a real grassroots business owner. She turned to the audience and with few words, asked everyone who was there in support of the trailer to stand up. Most in the room stood up. Someone less familiar with the Board members then approached the front. It was Ed Harris – representing the Lifeguard union. “When we [lifeguards] need police, we need them fast,” he said. He asked the Board to approve the trailer, even though he said, “there’s too many trailers” around, meaning that there weren’t sufficient permanent facilities for first responders like lifeguards and police officers. He also asked the Board “to look at the larger picture,” to pressure for the inclusion of a police sub-station in the next lifeguard station to be built in Ocean Beach. Harris also mentioned that he was “hoping to bring police back to Mission Bay,” and had a place where they could set up. Others got up and briefly stated that they supported the police trailer; Joe Ghio, Gretchen Newsomb, and Tom Perotti, of the OB Community Development Corporation, did so. Also in attendance were Mike Akee, head of the OBMA, and Jim Musgrove, former head of the OB Town Council. Local resident and property owner Vince Adame. Finally, Jane Gawronski recognized Vince Adame – a local who apparently was one who had complained to the Coastal Commission about the trailer. Adame, accompanied by several companions and supporters, stated that his family had lived and owned property in OB for “one hundred years”. He then bluntly told the crowd that “the trailer has not done anything for the community.” He went on to say “What’s helpful are the phone calls to police,” explaining that citizen complaints drive police responses, not the trailer, which is an “eyesore”. “Let the public decide,” he stated, saying that was his goal of bringing us the trailer issue all along. Adame welcomed the police presence in OB and at the waterfront, but he said he doesn’t support the current location of the trailer, because it is an eyesore, it blocks a public view, and it is not properly permitted because it is no longer “temporary”. Adame stated that his view is blocked, and that he lives right off the alley where people stop to view the surf conditions. “The spot where the trailer is,” he said, “no one stops – the view is blocked.” Also, the trailer is “taking up valuable parking space,” he said. Making a couple of allegations that were not verified and several there were reasonable, Adame claimed that the permit to the Coastal Commission is not being applied for by the City of San Diego or by the Police Department, but by an individual, “a private person”, he said, indicating Lt. Stone. Commenting that Lt Stone was not familiar with the community, Adame claimed that Asst Chief Long was working with him in looking for another location. “I have Chief Boyd Long on my voice mail,” Adame said, asking the crowd a couple of times if they wanted to hear it. No one took him up on it. Adame stated that he had brought this issue up five years ago, and it took the Coastal Commission two years to get to it. “The trailer is a restroom and storage,” Adame said, “there is no public access,” explaining that people cannot talk to a police officer by going into the trailer. “I have found another location,” he said, “under the pier.” Adame also stated that there is a location at Robb Field that has water, power, and is next to the police supply facility. “The police are not allowed to staff it” he said, referring to the trailer, because of budget constraints and can “only use the restroom.” Vince Adame had said his piece. Eyes turned to Lt Stone who reiterated that it is indeed the San Diego Police Department that is making the application. And it will cost between $5,000 and $8,000 – “whether we win or not,” she added. As no one else from the audience spoke against the trailer, Chair Gawronski turned to the Board for its comments. Bushe did remind the Board that the permit was for a specific location and address, implying that it couldn’t be used for the trailer at a different location. Scott Waschitz raised the issue that perhaps the community wanted the trailer but wanted it moved to a different location. At this point Landry Watson spoke, reminding the Board that during the meeting of his Project Review Committee, the motion to support the trailer at the same location failed for lack of a second. The committee did pass, he said, a motion to temporarily allow it to remain at the same location but to actively search for a new site. 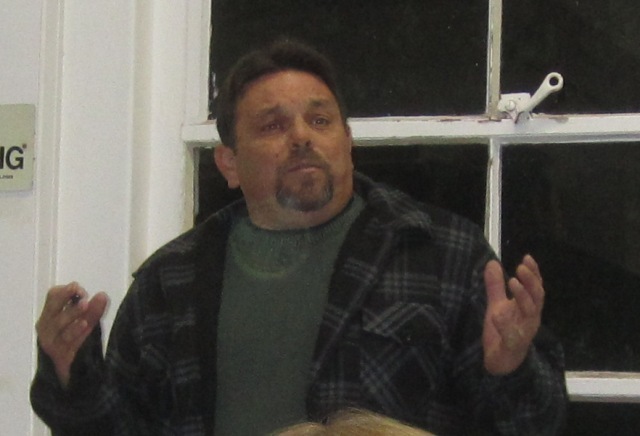 Ed Harris – far right – addresses the Board. Harris represents the lifeguard union. “I spend a lot of time on the seawall,” Therkaslsen said, “I’ve never seen anyone enter or exit the trailer.” He questioned the location and asked why the community couldn’t place it elsewhere. Next in line to speak from the Board, Barbara Schmidtknecht questioned why the trailer couldn’t be moved underneath the pier. “If there’s lots of crime there,” she pondered. Lt Stone quickly shot back that under the pier was not technically safe for the trailer – people could have easy access to the trailer, could throw objects – like flares – on it. Yet Schmidtknecht had caught the police in a contradiction. The police have been saying that the trailer must stay in the parking lot because of all the crime under the pier. But the trailer couldn’t be moved under the pier because … of all the crime there, in so many words. Schmidtknecht was simply pointing out the obvious conclusion: move the trailer under the pier and the crime would fade away from under the pier – therefore, making it safe for the trailer. Tom Gawronski raised the issue that he couldn’t see recommending a temporary use to the Coastal Commission. At this point, the Board launched into a discussion of having a future police sub-station included in a new lifeguard station that the community wanted and needed – yet folks were aware that there are no explicit plans for one. This morphed into a discussion of what kind of motion the Board could accept. More discussion continued as Bill Bushe made a motion to approve the permit with conditions, seconded by Tom Gawronski. There was more back and forth, and finally the wording was settled upon: – a motion to approve the request for the permit but with an addendum that stated the support was conditional upon and until a more suitable and permanent location could be found. Or words to that effect. 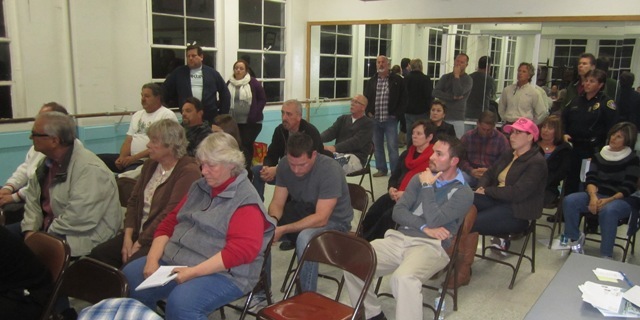 The Board voted: it was 8 to 1 for approval – with Scott Therkasen being the lone dissenter. Under the pier is the correct location, I’ve wondered why they haven’t done this for years. Frees up parking, doesn’t look like an eyesore & gets rid of the groups that sit under the pier harassing people. And Flares, really? Couldn’t someone just as easily throw one on any roof? I know many folks who won’t go up the pier stairs, but would rather take the alley next to South Beach to access the pier. The closer you to the bottom of the stairs and around the corner, the worse it gets. Also, I think a police logo would be nice as well, some of these “travelers” probably think it’s just some random trailer. (Think empty police car on the side of busy roads.) The presence of the trailer in its current locations hasn’t prevented many of the crimes that have taken place. And can someone mention to Lt. Stone that cops hanging out at local markets parking lots doesn’t deter crime, driving the alleys and streets does. I see the same cop every morning in the same lot just hanging out. Drive the alley, look for trouble! Nice work on this Frank thanks !! OBhave I agree, police need to get out of their cars and walk the beat. Physical presence is the only was to deter the element so many complain about. Crack is routinely smoked openly under the bridge! Our planning board should require the trailer to comply with all permits, coastal laws etc. so stop whinning about variences along West Point Loma. Rules and laws should apply to all in our community. Readers: we have a brand new OB Rag poll about the trailer over in our sidebar. Please check it out and let’s hear your best option. We can do better than a trailer in a parking lot for our police officers, the organization that pays for the trailer is the Ocean Beach Mainstreet Association it is made up of local business & commercial property owners, at least 30 of them attended the planning board meeting, it’s a shame NOT ONE is willing to provide a 10′ x 10′ office and a restroom, that’s all they need !, yet they find it easy to take parking spaces from their potential customers, create blight & block one of the best views of the surf in Ocean Beach ? Lt. Stone argued that the trailer needed to stay in the EXACT location or nothing ? this bully in a police uniform is not speaking on behalf of S.D.P.D. she is a puppet for the O.B.M.A. in an S.D.P.D. uniform. Police will respond in a timely manner with or without a trailer. Jan. 3rd the day after the planning board meeting Asst. Chief Long & others walked the parking lots and where shown various alternate locations with existing water and power, the chief agreed that all locations would be considered. The safety of this community will not be held hostage by the demands of one cop & the O.B.M.A. . 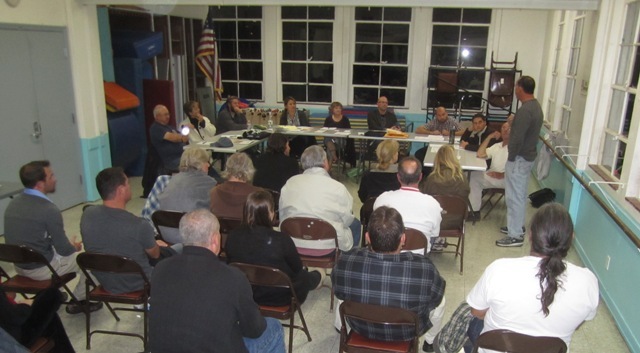 The Ocean Beach Planning Board and it’s members are doing a great job of balancing the needs of both residents and police……it helps when people tell the truth and are honest about options. I leave you with a quote . As I was checking the latest comments on this article, I noticed my previous comment had my moniker in blue and the others were in black “ink”. Is there some significance placed upon the different color “inks”? After consulting with our tech desk, I was informed that the reason some names – such as yours – are in blue – is because when you made your comment, you typed in “obrag.org” – which links back to our homepage. You don’t need to do that in order to leave a comment, Mr Rick. Happy New Year, dude. Have police trailer (substation) is a good thing. I do think that the police should have some storefront hours even if it is very limited. Finding a permanent location is a good idea, but I am concerned that it will become another multimillion dollar fiasco like the restroom at south beach. I like the idea of a building next to lifeguard tower. Building under the pier seems problematic. Due to high tide and flooding. Just wondering how much does it cost to rent that trailer? Or does OBMA own it? Who is responsible for maintenance on it , who insures it , say it was to catch fire who is responsible ? It has been in the lot for 14 years what has its total cost been ?